This anthology from Witty Bard contains nine stories, which range across the genre from urban to epic to humorous to tragic. As is the case with many anthologies, the tales vary in quality; some are fully polished, while others need another round of editing. There are also a few formatting errors (such as oddly-indented paragraphs). Overall, I enjoyed this collection very much. “Jennie’s Wolf” by Jamie Marchant is one of my favorites in the collection. It might be classified as an urban fantasy-late bloomer story. Arlene is a shaman who doesn’t realize that she is a shaman until a pack of werewolves seek her out to save one of their pups. Fun characters, and a richly-realized world. I hope to read more stories by Marchant. “Care and Feeding” by Edward Ahern is a humorous urban fantasy tale. Imagine running from the schoolyard bully, taking refuge on the edge of the local dump — and discovering a nest of dragons? Love the interaction between Terry and the very literal, very pragmatic dragon Hrraushtu. (Guess what flying saucers really are. Yep.) This one had me giggling all the way through. I hope Ahern writes more stories about Terry and Hrraushtu. “Spring Can Really Hang You Up the Most” by Skye Allen is another of my favorites. Wendy is an old-school dj: she uses wax cylinder cones and an antique bronze-horned morning glory. Dead broke, homeless, hungry, and desperate, she ignores her instincts and takes the oddest job of her career. Only after she arrives at the underground club does she realize that it is a faery revel, and that she has been invited to stay — whether she wants to or not …. Spooky and lyrical. I want more stories from Allen. “Dragon Slayer” by Matthew McKiernan is an epic fantasy tale. The premise is interesting — Darren must slay a dragon and bring proof back to Bregon to become king — but the story is awkwardly-constructed. There is a lot of unnecessary info-dumping, and the narrative jumps between points of view. I think that telling the story only from the perspective of the dragons Denark and Bright Eyes would have made for a stronger, more unique tale. “A Small Detour” by Elena Linville is a mythological fantasy loosely based on Northern European lore. Ryssa is a fledgling Eye of the Norns, sent out into the world on her first mission. When she is waylaid and her horse stolen, she finds herself stranded in the middle of monster-haunted woods. Nothing happens by chance, though: the Norns have a plan for their young priestess. Great story with a tragic element, unusual magic, and a well-developed world that could easily host many, many more adventures. “Knight of My Heart” by Ellie Christina is a heroic, romantic tale written in the form of a stream-of-consciousness letter. When a dragon threatens her village, a woman takes up her sword to defend her loved ones. In what may be her last letter to her beloved knight, she weaves back and forth between terror and determination, fear and hope. The prose is a tad too purple in places, but it is still deeply romantic. “The Knife” by Gregg Chamberlain might be more accurately categorized as a folktale or morality tale, as opposed to straight-up fantasy (but the line is blurry). When a Fool finds a Knife beside a river, he is tempted to throw it in the water. The Knife attempts to bribe the Fool into keeping him, but the Fool will have none of it. Unfortunately, the Merchant who happens upon the scene is not so wise as the Fool …. A short, clever tale with a tragic ending. “Texas Twister” by Dana Wright is an urban fantasy revenge tale. Beware Texas knitting circles: they may actually be a coven of witches. And when one member — in this case, Magdalay — suspects that her husband is having an affair with an old rival, watch out! Nature hath no fury like a pissed off witch. Fun characters, snappy dialogue, and a deliciously righteous revenge. My only critique is that the denouement felt a tad awkward, like it was tacked on. I could definitely see more stories centered around Magdalay and her sisters in the Goddess. The final story in the collection, “Lost in the Woods” by Erik Schubach, is a funny, sweet fantasy with a twist ending. Raised in isolation on a mountain, a child is allowed to travel down to the woods with his mother for the first time. When they are separated, the child finds himself face-to-face with a pack of large, hungry wolves …. Adorable narrator, and I like the surprise at the end. 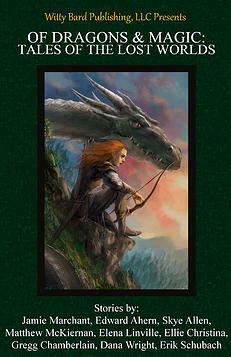 Of Dragons and Magic is the first fantasy anthology from Witty Bard Publishing — and I hope that it is the first of many. The stories are quick and entertaining; perfect for reading on a lunch break or while waiting in the doctor’s office. Recommended to fans of all of these authors, as well as fans of Jolene Dawe, Juli D Revezzo, Nancy Jane Moore, Doranna Durgin, and Elaine Corvidae.